Halloween . . . CANDY!! Surprise! After a couple of epic Halloween parties over the last 4 or 5 years, we decided last year to make the party an annual event moving forward so everyone knew what to expect each year. My boys are ALL about it. They have helped me decorate and painted pumpkins. They're super excited about what they are dressing up as on Saturday. But the one thing I don't want them involved in yet . 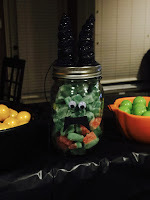 . . is the CANDY! 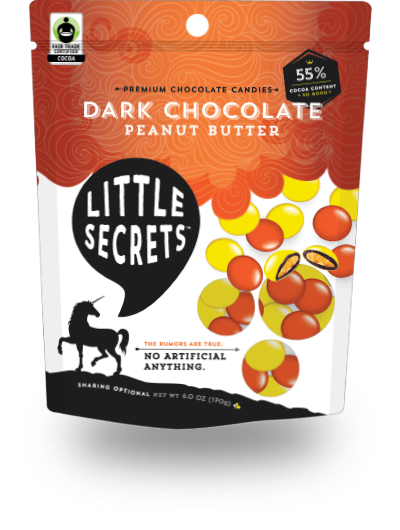 But SourJacks and Little Secrets sent us some sample candies and we wanted to create something Halloween themed so we could enjoy looking at them and still have some left to share when company arrives. 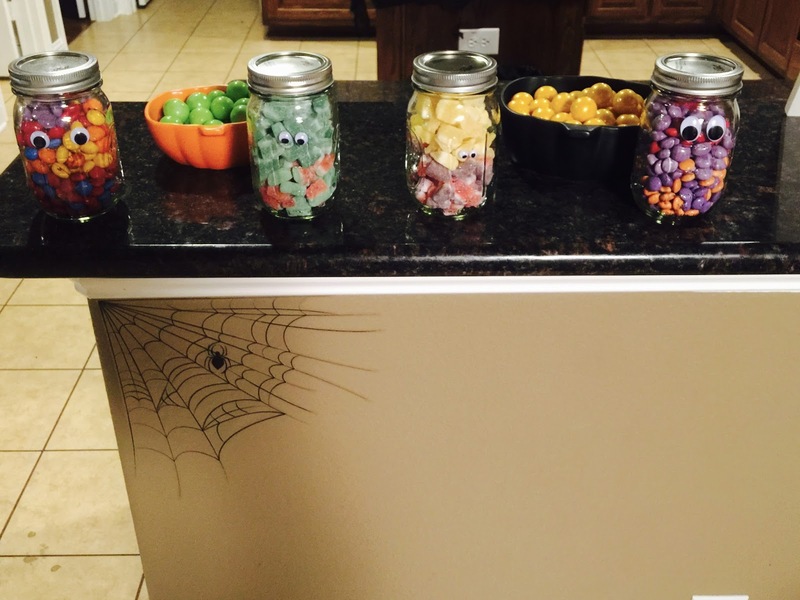 So Joey and I decided we could get crafty and decorative all on our own after the boys went to bed, and this is what we came up with . 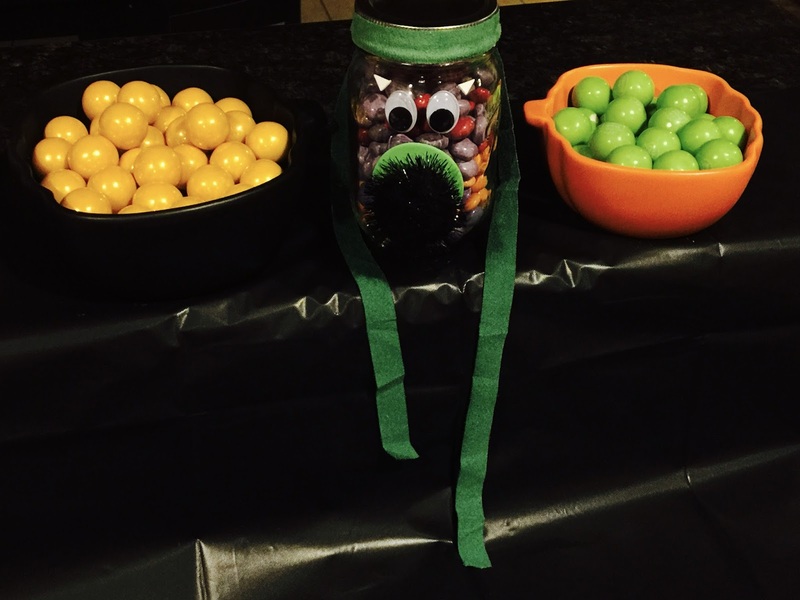 . .
Those are some seriously funky monster jars holding amazing candy that will disappear when I allow everyone to open them up this coming Saturday. Sour Jacks are gluten-free candies that will pucker your mouth. We were sent samples of Green Apple, Wildberry, Lemonade and Watermelon. Little Secrets are all fair trade, chocolate candies in a variety of flavors from peanut butter to raspberry. We used leftover craft supplies from scrapbooking adhesive to googly eyes and stickers to create fun faces that everyone will enjoy . . . and not be scared of. 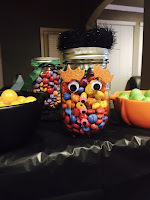 I'm sure many of you are far more creative than I am and can come up with some extraordinary craft and treat ideas using these candies and more. Follow Melissa's board Halloween Treats on Pinterest. Take a look at the great Halloween treat ideas on this Pinterest board and if you have one to share, post the link in the comments so I can add it!